Please refer to our stock # TG10056 when inquiring. This is a beautiful design as is usually the way of Mazer Bros jewelry. The necklace is about 16" long - with 3 of thses inches being in the rigid front piece. There are lots of different shapes and szes of rhinestones. The matching Bracelet is about 7 inches long and it has a safety chain. The rigid piecein the middle is 2" wide. 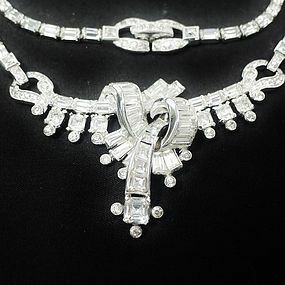 The backs of both pieces are shiny rhodium plated, and both pieces are in excelent condition with no dark or turning rhinestones nor any problems. Both pieces are marked. It is truly a treasure.